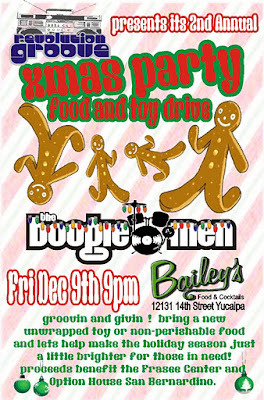 Revolution Groove: Xmas Party and Food/Toy Drive featuring The BoogieMen! Xmas Party and Food/Toy Drive featuring The BoogieMen! Come join us for another installment of our "do something" collaborations as we present our 2nd Annual Xmas Party-Food and Toy Drive ! We will be rockin Bailey's and helping make someone's holiday season just a little brighter! Come Give...Come Laugh....Come Boogie!